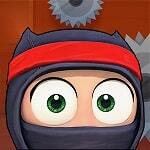 Use the rope in the game Ultimate Ninja Swing to overcome obstacles and reach the end of the level. Complete all levels, the difficulty of which increases gradually. Watch out for traps and don’t fall down!